Folder Guard can hide your personal folders from other users. Attention System Administrators: Folder Guard is enterprise-ready! The Folder Guard Administrator's Kit is available now. Folder Guard is suitable for a wide range of computer security tasks. 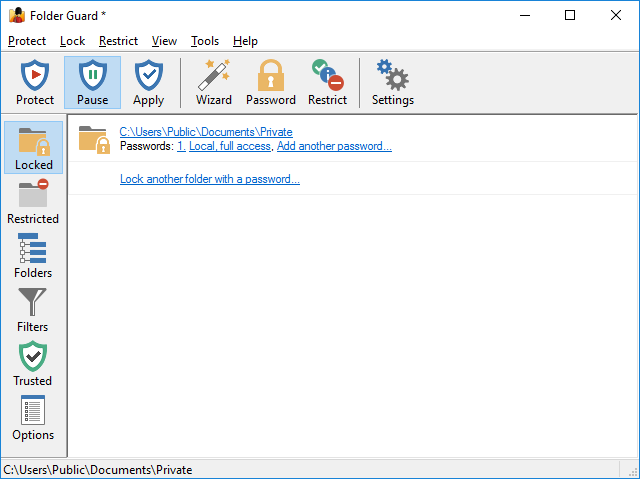 Folder Guard protects your files without encrypting them. 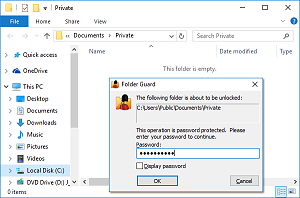 Folder Guard lets you quickly enable or disable the protection via a "hot key"
You can choose a specific keyboard combination as your Folder Guard hot key, and quickly enable or disable protection of your computer. Of course, the hot key is protected with your password, so only you can use it! Folder Guard can operate in "stealth mode". Folder Guard supports easy recovery in case of emergency. Folder Guard works with drives of any format. Folder Guard runs on a wide range of Windows platforms. From Windows 7 to Windows 10 and later, with all service packs and hotfixes, all are supported by Folder Guard. Folder Guard "speaks" plain English. You don't have to be a computer professional to understand how to use Folder Guard. 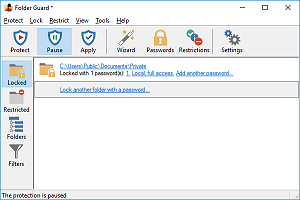 Its Wizard can guide you through the steps necessary to set up the password protection of your personal folders. Folder Guard Advisor warns you about situations that may require your attention and offers possible workarounds. Folder Guard User's Guide describes its commands and operation in plain English, without "pseudo-techno" or "geeky" talk. (And it does not baby-sit you either). Folder Guard is not a toy. Folder Guard is widely used. Folder Guard can be used with other disk tools. You can designate your anti-virus and other disk maintenance tools to be "trusted" programs, to make them able to work with your protected disks without restrictions. Folder Guard protection is extensible. Folder Guard will save you hours of learning time. For corporate customers we offer a separate build of Folder Guard that does not require license validation over the Internet. The Folder Guard Administrator's Kit contains the installation files in both the EXE and MSI formats, allowing the system administrators to quickly deploy Folder Guard to a large number of computers. The Kit also contains a Group Policy template that you can use to automatically deliver the license key to a large number of the client computers. Folder Guard is actively maintained. Since its first release back in 1997, we've been continuously extending, enhancing, and improving Folder Guard. Now in version 19.4, Folder Guard gives you more power than ever.